ABC Sewer provides fast, affordable emergency sewer and drain cleaning in the greater Milwaukee area. ABC Sewer provides lightning fast, courteous service to commercial establishments in SE Wisconsin. We’re a landlord’s best friend with our emergency sewer and drain cleaning, even on nights and weekends. 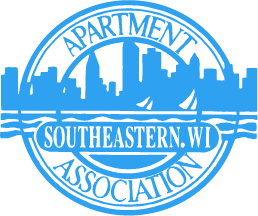 Proud member of the Apartment Association of SE WI, Inc.
ABC Sewer offers Milwaukee’s most reliable emergency sewer and drain cleaning service. We provide emergency draining cleaning of sinks, bathtubs, toilets, grease traps, urinals, parking lot drains and more. ABC Sewer uses the latest, state-of-the-art equipment including powerful augers, snakes and video inspection cameras to provide the entire Milwaukee area with emergency sewer and drain cleaning services. ABC Sewer offers low cost sewer and drain cleaning service to S.E. Wisconsin. In fact, we haven’t raised our prices in three years. And you get friendly and courteous technicians that get the job done fast. We've been providing prompt, courteous sewer and drain cleaning service to SE Wisconsin for over 25 years with fair, honest pricing.